My Valentine’s Day present this year from my dear husband was the NASCAR HotPass from DirecTV. Two years ago, that might have been the death knell for us. But this year, it’s quite different. It may have been the most thoughtful Valentine’s gift ever. I used to have a stereotype in my mind — one held by many, I’d imagine — of what a NASCAR fan was like. I certainly didn’t fit that mold, at least so I thought. At first, I’d only watch the races when they were in HD. The races started to become interesting to follow when I could tell which cars were which, thanks to the new technology that was available. A year ago, I tended to call it NAPcar: I’d put on a race (only if I could watch in HD), then snuggle in for a nice nap on a Sunday afternoon. So what is it that draws me to NASCAR now? Listening to the drivers and their crews communicate (especially when I am “in the car” on one of the four driver channels on HotPass) fascinates me. I know that when I am stressed, it’s tough for me to listen well to those around me. I cannot imagine how difficult it must be to listen well in a situation where so many lives and so much money are on the line . . . Watching the nonverbal communication on Pit Road intrigues me. Observing the driver interviews after a race is fun. I enjoy seeing how an individual driver gets better and better through a series of interviews. Even though these guys (and at this point, they are all guys) have driven faster and harder than I ever have or will in my lifetime, they must compose themselves for the camera. Note how often they thank their teammates, and how many sponsors they mention. And there’s more. Stay tuned. 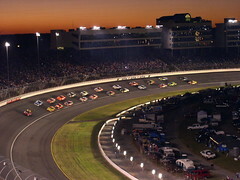 Photo Credit: Nascar – Getting Ready to Start the Race at Sundown, Originally uploaded by frostyrellik at Flickr. NOTE: I learned a lot about how to watch a race through Liz Allison’s book The Girl’s Guide to NASCAR . This week, I had the opportunity to share some of my thoughts on ethics in the field of public relations with classes from Georgia Southern. I promised the students that I would post my slides here, and since the presentation was on ethics, it made lots of sense to follow through on my promise — so here are the slides. Something that intrigued the students was this image. What do you see here? 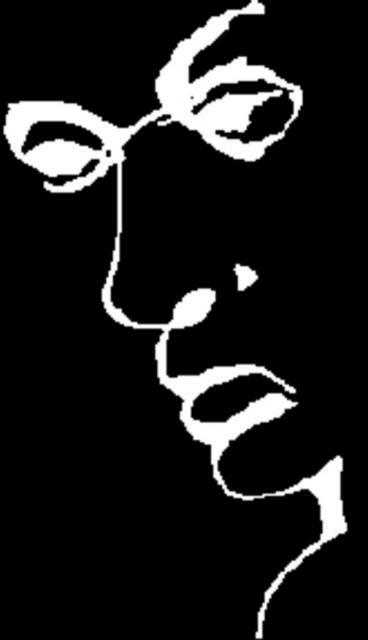 Now tilt your head to the right . . . do you see anything different?